The best budgie toys will keep them occupied safely when you're not around. Budgies, also called budgerigars, are energetic, intelligent birds that need to play as part of a healthy lifestyle. The best toys for budgies are safe, durable and provide a variety of types of play. 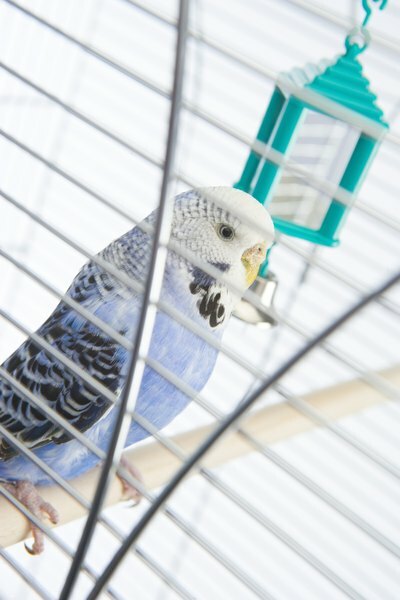 Choosing the best toys for your budgie will ensure you have a happy and healthy pet. Play gyms provide a variety of activities for budgies and combine elements of several bird toys. Play gyms allow budgies to climb, chew, ring bells and move objects. The best play gyms will combine several interactive elements while still being made mostly of natural, nontoxic materials. Budgies, especially the females, have a natural instinct to chew, so providing a chew toy is essential to their happiness. Chewing sharpens budgies' beaks and provides a satisfying activity for them to do when on their own. The best chew toys are made from nontoxic, safe-to-swallow materials such as wood, cotton or paper. Items similar to what they would find in the wild are ideal, such as branches or bark. Chain toys are any kind of toy that hangs from the ceiling of the cage and provides a climbing and chewing element for your budgie. The best chain toys are made from natural fibers, such as hemp or wood, and double as a chew toy. An ideal chain toy will include a bell at the bottom that gives your budgie extra enjoyment during play. Budgies enjoy rolling small, lightweight balls around their cages, and even throwing them as an interactive game with their owner. Balls encourage movement and exercise for your budgie, contributing to his overall physical and mental health. Budgie Info: Tons of Fun From Your Budgie Toys!